Photo by Laila Proulx. 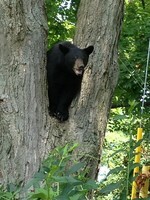 Bear in a tree on Pine Street. Photo by Laila Proulx. Bear on Pine Street. 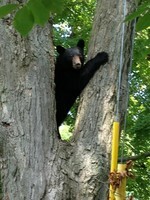 Laila Proulx took these photos of a bear in a tree on Pine Street on July 7, 2013. Laila saw the bear climb a fence and move from one neighbor's yard to the next.